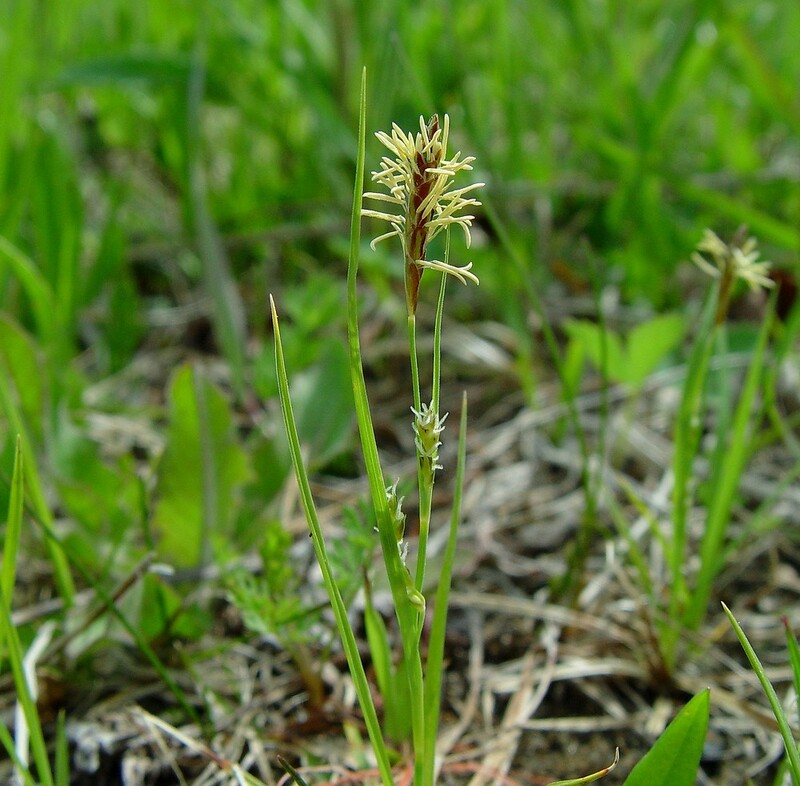 Carex tetanica young plant. ~ By Arthur Haines. ~ Copyright © 2017. ~ arthurhaines@wildblue.net (Accessed 12/2017). Carex tetanica is a perennial sedge, colonial from rhizomes, tufted, stems often brownish near base, ca 50 ca tall, stem bases leafy and fibrous from old leaf bases. 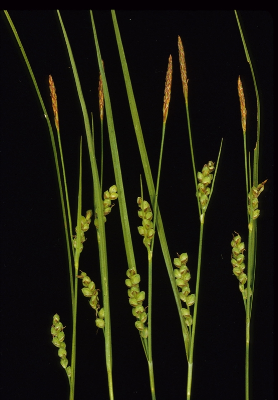 Leaves flat, about 0.3 cm wide; thin, green, edges curling backwards in age, shorter than fertile stems; leafy basal bract of inflorescence with well developed sheath. 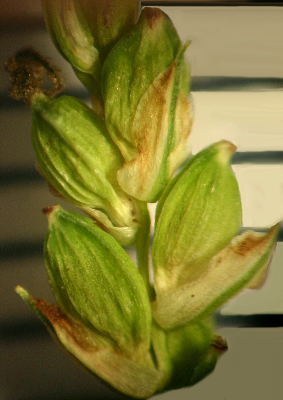 Carex tetanica inflorescences. A. A. Reznicek. Herbarium of the University of Michigan. michiganflora.net (Accessed 12/2017). Flowers: male spikes at top of inflorescence stalk, about 3 cm long; female spikes 1-3, widely separated, erect, about 1-4 cm long, 0.4 cm wide, densely flowered above, more sparse near base, flowers (perigynia) about 0.3 cm long, 0.2 cm wide, angular, tapered at both ends, flower scales brownish, 3-veined with green center, about as long as perigynia, spike not appearing bristly, stalk rough; blooms and fruits May-July. Carex tetnica perigynia. L. Curtis. Herbarium of the University of Michigan. michiganflora.net (Accessed 12/2017). Habitat: Wet open or part shaded areas.